Once you have understood everything discussed in above 2 parts, only then proceed to this part for complete understanding. If you purchased the kit, you must be having a nail cleanser too along with a lint free wipe. Apply some cleaner on your nail with the help of the wipe. This helps to ensure that there isn’t any residue left on the nail. TIP: If your kit does not contain the cleanser, you can use the substitute “Pure Acetone” as well. 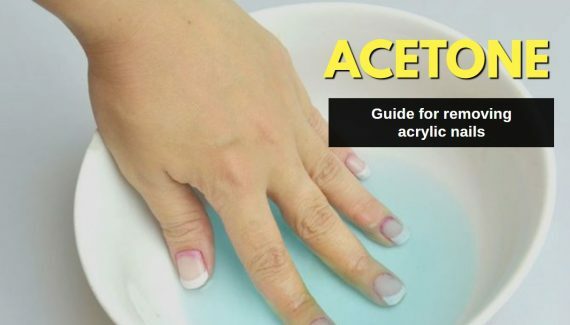 Do not use acetone based polish remover as that won’t help here. 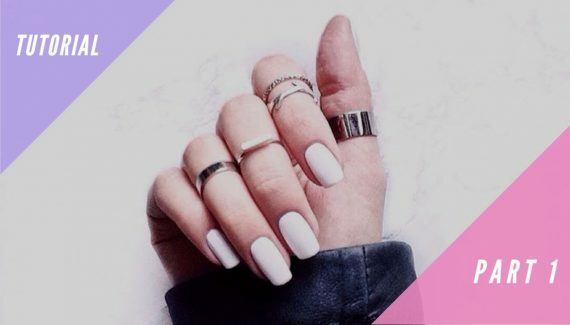 You need to find the right size of tips for your nails. What exactly is the right size? The tips which fits perfectly on both sides of your nail is the right size but definitely ready made tips won’t perfectly fit you. You will find the tips which are either short or little extra in size. Which one to choose? Always go with the one which is bigger than your nail width and then file it to the correct size using a nail filer and buffer. You must not forcefully fit the shorter tip on your nail as it may then lift up later and will continue pinching you. Now apply some glue on the tip (not on the nail bed). Then gently slip the tip down your nail till halfway. Keep it in place holding it for about 30 to 45 seconds. TIP: When you slip the tip then hold your nail at an angle of 45 degrees to make sure glue doesn’t flow down on your finger as it will be then very difficult to remove the dried glue after tip is fixed. TIP: If any glue flows around the nail, gently wipe it using the soft nail wipe. TIP: If your tip crooked while applying, then wash the nail with warm water to make the tip soft and then remove it. Reapply the fresh tip. Now take two separate dishes or one with 2 divisions. Take the acrylic liquid in one and acrylic powder in another dish. TIP: You definitely want to take the liquid in separate dish as directly dipping the brush in the liquid bottle will spoil the whole container and make it unusable for next time. Gently dip the tip of the brush into the liquid to make it wet and pull it back sliding it across the dish edge to remove excess liquid. Quickly dip the moistened tip into the powder and pull it back without taking too much powder. Repeat this step 4-5 times to have an even mixture of liquid and powder on the tip of brush making a small round ball looking like a bead. Making a perfect bead is an art at which you keep getting better the more you practice. The ratio of liquid and powder should be 40 : 60 respectively. Its just an approximate ratio but our main purpose is to form neither too wet nor too dry bead. If the bead is quite wet then use paper towel to remove the excess liquid. We need to apply the mixture on the complete nail divided into 3 zones. First zone starts from down the smile line till the halfway. Take the bead and apply the acrylic along the smile line and then move the brush in straight motion upwards. Then apply acrylic in zone 2 i.e. from halfway till the end of natural nail gently. Finally apply the acrylic in zone 3 i.e. the tip beyond the length of natural nail. You may want to apply more acrylic on the edge of the tip where it is glued on the nail in such a manner that edge transforms into a gentle slope. TIP: You need to apply acrylic quickly as it dries out very fast. TAKE CARE: Do not apply acrylic on your skin or cuticle. To achieve this, you should leave the first few mm from the cuticle untouched. TIP: While applying if the acrylic isn’t spreading freely then dip the brush in liquid again to make it wet and then try. Finally apply the last coat down from the smile line towards end of the tip to form smooth acrylic coating. TIP: Try to keep the acrylic coat thicker around the smile line as zone 1 receives the maximum pressure. Finally, leave your hand still for next 8-10 minutes so acrylic sets and harden. Try to test by tapping the brush end on the nail. If all went well, then you should hear a knocking sound. TIP: Do not just leave the brush after you are done. Clean it well with acrylic liquid if you plan to use it the next time or its ruined!